Korean food? Not a problem. At Soban K-Town Grill, they have excellent food, great ambiance and awesome service, plus, every meal comes with unlimited sides! Unlimited soup, kimchi, egg roll (gyeran mari), pamuchim salad and mashed potato (gamja sarada). Soban K-Town Grill is the result of the gastronomic relationship of award-winning Korean restaurateur, Mr. 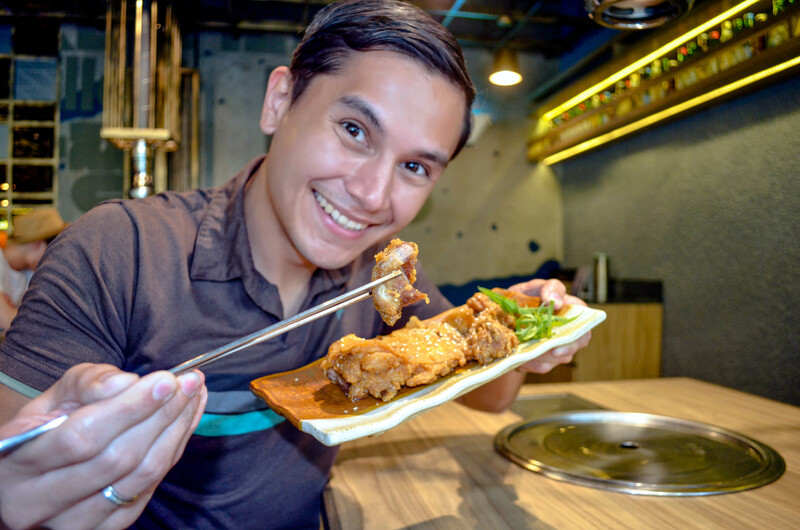 Sung Rah, of Sariwon Korean Barbecue, and Happyfoods Group of Restaurants, the Philippine franchisee. Soban means small tray or table. I really enjoyed their quick and very affordable Beef Korilog. It’s Korean beef with kimchi fried rice and egg. This comes with unlimited kimchi and egg roll. It’s available from Mon-Fri from 11AM-4PM. If you like chicken, you’ll surely love the Dak Ganjeong Set. It’s caramelized boneless fried chicken that comes with unlimited soup, kimchi, egg roll, pamuchim salad and mashed potato. I highly recommend the Ultimate Beef Bap, which is 100 grams of beef belly mixed with rice, assorted vegetables and fried egg in a sizzling bowl. This also comes with unlimited soup, kimchi, egg roll, pamuchim salad and mashed potato. Their Yangnyeom Tohsisal Set is another bestseller on the menu. It’s grilled USDA choice premium marinated beef set that comes with unlimited soup, kimchi, egg roll, pamuchim salad and mashed potato. They serve the beef raw, with garlic and onions, for you to grill. I asked the server to grill it for me. You put red bean paste on the beef and wrap it in lettuce, and enjoy!!! The shakes they serve are very refreshing and perfect to beat the summer heat. Try their mango, lychee and mango banana shakes. For desserts, I loved their Coffee Prince. I love coffee and I love ice cream. Best deal. Hahaha. It’s homemade coffee ice cream on a bed of soft graham and Korean red beans. You can also ask for the Ice Cream Trio, and that’s 3 scoops of homemade ice cream in a bowl: cookies and cream, vanilla and coffee. Now if you like Coffee Jelly, they also have this but they serve this as a complimentary treat for special occasions like for birthday celebrants. During off-peak hours, you can just walk-in this restaurant like in the late afternoon. But during peak hours for lunch or dinner, better come early or have seats reserved because the place is packed at these times. When I go back, here’s something to look forward to — tacos! Yes, tacos. Soban K-Town Grill isn’t just your regular Korean restaurant. They have playful dishes with a twist inspired by K-Town communities in Los Angeles harmonizing American comfort food and Mexican street food in their Korean fusion cuisine. *Rates above do not include service charge and may change without prior notice.